Vignettes And Characters Shift In 'Chameleons' In The Book of Chameleons, a gecko narrator weaves fragmentary tales of invented pasts into a story of charming airiness. The prize-winning Portuguese novel is set in post-civil war Angola. The "beach read" has never held much appeal for me — just because it's summer, it's not like my IQ drops low enough to be talked down to by James Patterson. But as the temperature rises, my attention span drops, and suddenly an entire episode of Project Runway is difficult to get through in one sitting. 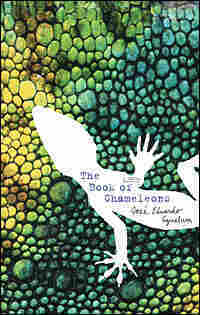 Fortunately, I came across Angola-born José Eduardo Agualusa's Independent Foreign Fiction Prize-winning The Book of Chameleons, a perfect read for my heat-addled brain. The story of the albino Félix Ventura is broken into a series of fragments, each section lasting only a few pages. In post-civil war Angola, Félix has switched from selling books to selling personal histories. His business card reads, "Give your children a better past." He forges family trees and stories of noble ancestry for those whose pasts need hiding or improving. The narrator is Eulalio, a dead man reincarnated as a gecko who lives in Félix's apartment and becomes his confidante. "I think what I do is really an advanced kind of literature," Felix tells Eulalio. "I create plots, I invent characters, but rather than keeping them trapped in a book I give them life, launching them out into reality." After Félix invents José Buchmann, a war photographer who has recently returned to Angola from exile, Buchmann seems to believe wholly in the lie. He becomes obsessed with tracking down his faux mother and draws Félix into his dark pasts, both real and created. At 48, Agualusa has been publishing novels in Portuguese since the late '80s, but The Book of Chameleons is his first work to appear in America. Despite the book's subject matter, it has a charming airiness. Feel free to put it down after every tiny segment. You'll certainly be back to see how it ends.